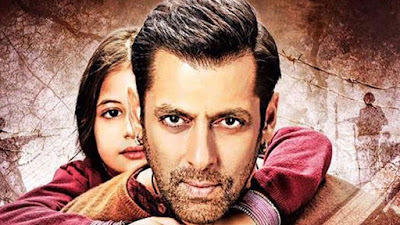 In India, Bajrangi Bhaijaan was released on 17 July 2015, one day before Eid. Simultaneously, the film was also released in 50 countries outside India. Now, after more than two years of its release, Bajrangi Bhaijan released in the Chinese theaters on March 2, 2018. The film directed by Kabir Khan stars Salmaan Khan, Kareena Kapoor Khan, Nawazuddin Siddiqui and Harshaal Malhotra. Salman Khan plays Pawan Kumar Chaturvedi alias Bajrangi, a devout Hindu Brahmin, good-for-nothing, but a pure-hearted devotee of Lord Hanuman, who tries to get Munni (a dumb girl from Pakistan lost in India) back to her home in Pakistan. In this film that touched everyone's heart, Pawan Kumar Chaturvedi (Salman Khan) puts his life at stake to protect the child. After watching the movie, people walked out of theaters with sweet smile on their faces. Bajrangi Bhaijaan is one of Salman’s most successful films. In India, the film earned Rs 320.84 crores. After Aamir Khan starrer Dangal, Salman Khan’s Bajrangi Bhaijaan has grabbed attention in China. Aamir’s Dangal earned $193 million in China and Secret Superstar earned Rs 63.40 crore in India & $117 million in China. 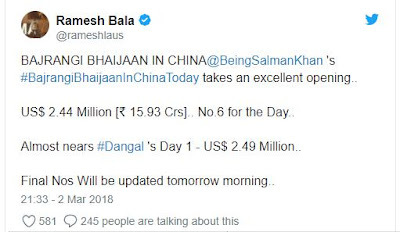 Only time will tell, whether, Salman Khan would be able to break Aamir Khan's record in China and rule the box office over there too, or not.